Nebuchadrezzar II (also Nebuchadnezzar; reigned 605-562 B.C.E. ), is the best-known ruler of Babylonia in the Chaldean Dynasty. He is famous for his conquests of Judah, his monumental building projects within his capital of Babylon, his role in the biblical books of Daniel and Jeremiah, and the construction of the Hanging Gardens of Babylon. He is traditionally called "Nebuchadrezzar the Great" and was referred to by the prophet Jeremiah as "God's servant." However, his destruction of the Temple and his forcing the citizens of Judah into exile caused his vilification in other parts of the Bible and Judaic tradition. This has caused him to be interpreted very differently by Judeo-Christians in the west compared to contemporary Iraq, where he is glorified as a great historic leader. Nebuchadrezzar was the oldest son and successor of Nabopolassar, who delivered Babylon from its dependence on Assyria and laid the great city of Nineveh in ruins. His reported marriage to Amyitis, the daughter of the Median ruler Cyaxares, united the Median and Chaldean dynasties, and—together with Nebuchadrezzar's outstanding qualities as a military leader and builder—made the Babylonian Empire the most powerful of its time. His name in Akkadian language, Nabû-kudurri-sur, is interpreted as "O Nebo, defend..." (either) "my offspring," "my empire," or "my boundary stone,” with Nebo being the Babylonian god of wisdom and son of the primary deity, Marduk. In an inscription he styles himself "Nebo's favorite." The Hebrew form is נבוכדנאצר, Nəbūkadnệzzar, and sometimes (in Jeremiah and Ezekiel) נבוכדראצר, Nəbūkadrệzzar. The Septuagint and Vulgate Bibles have Ναβουχοδονοσορ, Nabuchodonosor, but the King James Bible re-introduces the Hebrew variants as Nebuchadnezzar and Nebuchadrezzar. The latter will be used in this article because it more closely resembles the Akkadian. When the Assyrian capital Nineveh was overrun by the Babylonians under Nabopolassar in 612 B.C.E., Egypt allied itself with the Assyrians and marched to their aid in 609. The Egyptian army of Pharaoh Necho II was delayed at Megiddo by the forces of King Josiah of Judah, who was killed in the battle. When the Egyptians met the full might of the Babylonian army, now led by the young general and crown prince Nebuchadrezzar, at Carchemish in 605, the combined Egyptian and Assyrian forces were soundly defeated. Assyria ceased to exist as an independent power, and Egypt retreated, no longer able to act as a significant force in the Middle East. 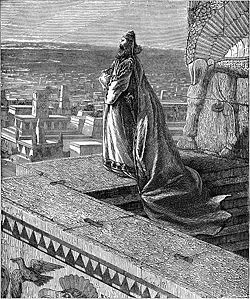 Ascending to the throne after his father's death, Nebuchadrezzar engaged in several successful military campaigns designed to increase Babylonian influence in Syria and Judah. A clash with the newly resurgent Egypt in 601, however, met with setbacks, leading to several rebellions among the states of the Levant, including Judah. Nebuchadrezzar soon dealt with these rebellions, capturing Jerusalem in 597 B.C.E., and bringing King Jehoiachin and other leading citizens of Judah to Babylon. When Pharaoh Apries attempted a new Egyptian invasion of Babylonian-controlled Palestine in 589, Judah and other states of the region once again rebelled, despite advice to the contrary by such figures as the prophet Jeremiah. Another siege of Jerusalem occurred in 587/586, ending in the destruction of both the city and the Temple, as well as the deportation of a new wave of exiles to Babylon. Nebuchadrezzar then engaged in a 13-year siege of great Phoenician city of Tyre (585-572 B.C.E. ), which ended, if not in outright victory, with the Tyrians accepting Babylonian authority. Following the pacification of Tyre, Nebuchadrezzar apparently turned again to Egypt. A clay tablet, now in the British Museum, bears the following inscription referring to his wars: "In the 37th year of Nebuchadrezzar, king of the country of Babylon, he went to Mitzraim (Egypt) to make war. Amasis II, king of Egypt, collected [his army], and marched and spread abroad." The greatest king of his age, Nebuchadrezzar died in Babylon between the second and sixth months of the forty-third year of his reign. Having completed the subjugation of Phoenicia and inflicted chastisement on Egypt, Nebuchadrezzar set himself to rebuild and adorn the city of Babylon. He constructed canals, aqueducts, and reservoirs and made Babylon into one of the wonders of the ancient world. He ordered the complete reconstruction of the imperial grounds, including rebuilding the Etemenanki ziggurat and the construction of the fabulous Ishtar Gate—the most spectacular of eight gates that ringed the perimeter of Babylon. 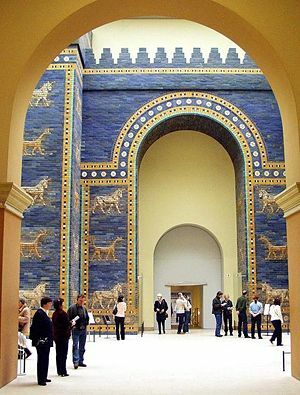 The Ishtar Gate survives today in the Pergamon Museum in Berlin. Nebuchadnezzar is also credited with the construction of the Hanging Gardens of Babylon, one of the Seven Wonders of the ancient world, said to have been built for his homesick wife, Amyitis. Nebuchadrezzar seems to have prided himself on his constructions more than on his military victories. During the last century of Nineveh's existence, Babylon had been greatly devastated. Nebuchadrezzar, continuing his father's work of reconstruction, aimed at making his capital one of the world's great cities. Old temples were restored, and new edifices of incredible magnificence were erected to the many gods of the Babylonian pantheon to complete the royal palace begun by Nabopolassar. Nothing was reportedly spared, neither cedar-wood, nor bronze, gold, silver, and precious stones. An underground passage and a stone bridge connected the two parts of the city separated by the Euphrates. The city itself was rendered impregnable by the construction of a triple line of walls. Nebuchadrezzar's activity was not confined to the capital. He is credited with the restoration of the Lake of Sippar, the opening of a port on the Persian Gulf, and the building of the famous Median wall between the Tigris and the Euphrates to protect the country against incursions from the North. These gigantic undertakings required an innumerable host of workmen. From the inscription of the great temple of Marduk, we may infer that captives brought from various parts of Western Asia probably made up a large part of the laboring force used in all his public works. The reconstructed Ishtar Gate at the Pergamon Museum. From Nebuchadrezzar's inscriptions and from the number of temples erected or restored by this prince, it seems that he was a very devout man. What is known of his history shows him to have been of a humane disposition, in striking contrast with the display of wanton cruelty of most Assyrian rulers. It was due to this moderation that Jerusalem was spared repeatedly, until its destruction became a political necessity. Rebel princes easily obtained pardon, and even Judah's rebellious king Zedekiah would have been treated with greater indulgence had he manifested less stubbornness (Jer. 38:17-18). Nebuchadrezzar showed much consideration to Jeremiah, leaving him free to accompany the exiles to Babylon or to remain in Jerusalem and appointing one of the prophet's friends, Gedaliah son of Ahikam, to the governorship of Judah. He granted likewise such a share of freedom to the exiled Jews that some rose to a position of prominence at court and Jeremiah reportedly thought it a duty to exhort his fellow-countrymen to have the welfare of Babylon at heart and to pray for her king (Jer. 29). Babylonian tradition has it that towards the end of his life, Nebuchadrezzar, inspired from on high, prophesied the impending ruin to the Chaldean Empire (Berosus and Abydenus in Eusebius, Praep. Evang. 9.41). Despite these impressive historical achievements, Nebuchadrezzar is most widely known through the sometimes-unflattering portrayal of him in the Bible, especially the Book of Daniel and, to a lesser degree, the Book of Jeremiah. As mentioned earlier, the biblical King Josiah met his death at the battle of Meggido in an action supporting the newly ascendant Babylonians against the forces of Pharaoh Necho II. Jeremiah, whose career, like Josiah's, opposed alliances with Egypt, argued powerfully in favor of Judah's cooperation with Babylon, a stance that put him into direct conflict both with Judah's later kings and with other prophets. Jeremiah believed that Nebuchadrezzar was "God's servant" (Jer. 25:29) who had been raised up to chastise Judah for her sins. He urged the kings of Judah to act as Nebuchadrezzar's loyal vassals rather than to seek independence or cooperation with Egypt against Babylonian hegemony. For speaking out in favor of Nebuchadrezzar, he narrowly avoided capital punishment, was banned from the Temple, endured beatings, and nearly starved to death in prison. As a result, when the Babylonians conquered Jerusalem, they showed Jeremiah great respect and unusual liberty (Jer 39:11-12). The prophet Ezekiel followed Jeremiah's lead in portraying Nebuchadrezzar as God's instrument to chastise both Tyre and Egypt (Ezek. 29-30). Even Nebuchadrezzar's destruction of the Temple of Jerusalem, according to Ezekiel, was carried out in accordance with God's will (Ezek. 24:21). A different attitude toward Nebuchadrezzar is evident in the Book of Daniel. Here, Nebuchadrezzar is the archetypal idol worshiper and tyrant. Although Daniel wins his favor by interpreting his dreams (Dan. 2), when the three young Hebrew noblemen Shadrach, Meshach, and Abednego refuse to participate in Nebuchadrezzar's state-required idolatry, he arrogantly throws them into a super-heated furnance, where they are protected by God's angel (Dan. 3). 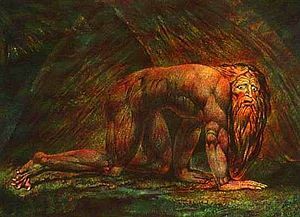 Because of his arrogance, Nebuchadrezzar loses his sanity and lives in the wild like an animal for seven years (Dan. 4) He eventually repents, however, and affirms the supremacy of Daniel's deity. Some scholars think that Daniel's portrayal of Nebuchadrezzar is a mixture of traditions about Nebuchadrezzar and Nabonidus, the last king of Babylon. For example, the seven years of insanity could be related to Nabonidus' reported time in the desert. Evidence for this view was found on fragments from the Dead Sea Scrolls that reference Nabonidus (N-b-n-y) being smitten by God with a fever for seven years of his reign while his son Belshazzar was regent. Nebuchadrezzar is also mentioned in several other biblical books, especially in the popular apocryphal book, Judith. Here, however, he is referred to as the king of Assyria, ruling from Nineveh—a clear and perhaps intentional inaccuracy. After his death, probably in October 562 B.C.E., having reigned 43 years, Nebuchadrezzar was succeeded by his son Amel-Marduk. After a reign of two years, Amel-Marduk was succeeded by Neriglissar (559-555), who was succeeded by Nabonidus (555-538). At the close of the reign of Nabonidus (less than a quarter of a century after the death of Nebuchadrezzar) Babylon fell to Cyrus of Persia at the head of the combined armies of Media and Persia. It was under Cyrus that the exiles from Judah were first allowed to return and rebuild the Temple destroyed by Nebuchadrezzar. This page was last modified on 23 December 2014, at 21:17.